I am a contemporary artist who explores abstraction and nature motifs in her works. I was trained under late pioneer finger painter Wu Tsai Yen, and hold an Art Education diploma from the Nanyang Academy of Fine Arts and an overseas Fine Arts graduate degree from Middlesex University, London, UK. 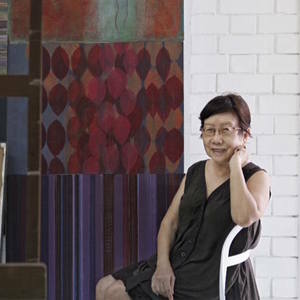 I was awarded First Prize in the Ray Fawcett Memorial Award, London (1996) and First Prize (Abstract category) in the Tan Tsze Chor Award (2003). My works have been exhibited at the Singapore Art Museum, the Esplanade, the Singapore Tyler Print Institute & the NAFA Galleries.